Have you ever wondered how to create a beautiful bouquet, or arrange a fresh floral display? Join us at The Adonis Flower School and learn some secrets! Your tutor Mark Garvie, is an international award winning floral designer. He has over 28 years experience in floristry and has travelled across Europe creating designs for events and weddings. Originally from the UK, Mark established his own floral business there before moving to Ireland and becoming part of the team at Adonis. He has tutored and demonstrated the art of floral design throughout the UK and now Ireland. Each class will cover 1 design style, and during each class, you will also be shown how to condition (treat) and look after fresh flowers. All materials will be supplied on the day, and a selection will be available to purchase during and after the class. Classes run from 7pm-9pm in our shop on Patrick street. 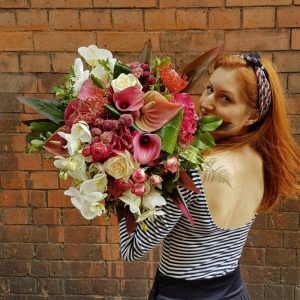 The handtied bouquet is the most popular floral design and here at The Adonis flower School we give you the opportunity to learn how to make beautiful handtied bouquets for your home or to give as a gift. 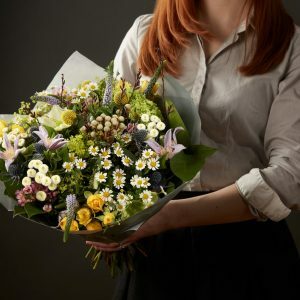 During this class, you will be shown how to create several designs using the same selection of flowers, receive tips on how to wrap and present the bouquet, and then given the choice which you would like to recreate yourself and take home with you to enjoy. We will also show you how to condition and look after fresh flowers and talk through the basic concepts of floral design. Ever wanted to learn how to create amazing designs in glass vases just like those fancy hotels do? 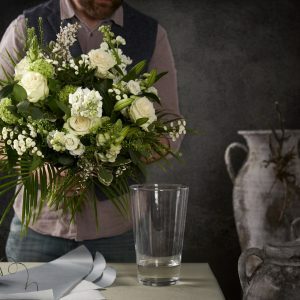 Your tutor Mark Garvie shall show you how to design and create stunning floral displays in glassware perfect for your home. Something different than the standard vase of flowers. Mark shall demonstrate a number of designs and you will get to pick one and create it for your abode or as a lovely gift. Vase included. In this class you shall be shown how to create a flower crown headpiece. This design has always been popular for weddings, especially the Bohemian style weddings, but has also become very popular for festival styling and even hen parties. Learn the techniques required to make the perfect flower crown and wear it with pride. If, in the event that you cannot make a class and cancel your place, we will put your name down for the next suitable class, on condition that we can fill your place on the original class. If the position cannot be filled, we will be unable to refund the payment.